Conducted by students at the Center for Documentary Studies at Duke University—Jen Skerritt (Herndon, Virginia) and McKay Ross (Whitney Point, New York). 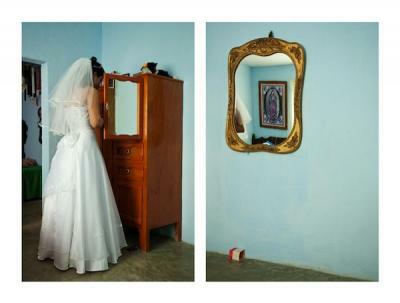 Why did you decide to do utilize diptychs in your work? This project started with the idea to portray the rancheros within their environment. Working with diptychs allows me to make more emphasis in the little details I find in their surroundings. By using two contiguous images I try to give more power to the images that show bits of information about their culture by pulling them out of the background, as they are generally used in a portrait, and setting them side by side with the person I am photographing. While I was working this way, I also started to photograph moments in their daily life. In this case, using two contiguous images allows me to play with time. It is the same event but each image is registered seconds, sometime minutes apart. I find these pieces more challenging to create because I have almost no time to scout the shot, it has to be identified and organized into a diptych at the time that is happening and you don’t know if it will work until you put the two images together. I find this way of shooting more exciting, even though I love doing the portrait part of the project too. While observing your pictures, I noticed that the first two pictures contained religious figures. Was the inclusion of these religious figures intentional? It is not my intention to include religious figures in the photographs; it is more to include anything in their surroundings that can portray or give more information about their culture. I am not attempting to go further with the meaning people might give to these religious icons, I am just capturing what I see that is relevant in the rancheros’ life. It is very common to find in almost every house these kind of religious figures and symbols, and that is why they appear in some images. I don’t consider myself a person of this culture even though I have been exposed to it since I was a kid; instead I grew up in a city, which is completely different. From what I have experienced and heard, they are forced to adapt to this new and “modern” way of life at a high price. The Baja Peninsula is one of the last territories in Mexico where a lot of the land is still (but not for much longer) in the hands of the people who work it (the rancheros). But the tourism industry and private investors will soon own the land as has already happened with most of the coast surrounding the peninsula. For me, development should mean something that can offer a better quality of life rather than earning more money, possessing more things, or making the biggest and most luxurious hotels. You referred to the rancheros as “part of your past and present.” After documenting these ways of life through photography, are you able to relate to them more? Definitely, I have a more thorough (but not complete) understanding of their culture than when I started this project nine months ago. Many ideas I had about them and their way of life have changed by spending a lot of time with them and being able to establish close relationships with some of them. What I can share with my photographs is just a small piece of all that I have learned and experienced at their side, and I hope that they work as a way for others to know them a little bit more.